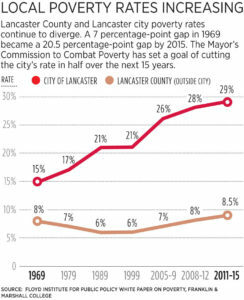 A special commission that has spent the past year studying ways to help the poor in Lancaster has issued an ambitious, 15-year plan to lift at least half out of poverty and place 3,000 into good-paying jobs. 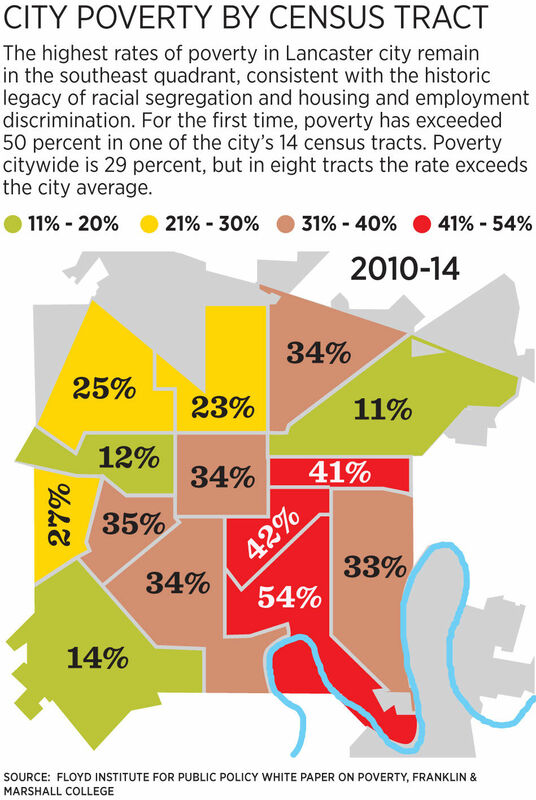 The Mayor’s Commission to Combat Poverty is also tapping a new, permanent coalition to lead the charge in halving the city’s poverty rate, which at 29 percent exceeds the rates for Philadelphia and Pittsburgh, by 2032. Gray accepted the 87-page report, titled “One Good Job,” at a celebration Thursday night at Tec Centro as the 11-member volunteer panel completed its year-long assignment. The commission spent $135,618, about half from the Lancaster County Community Foundation. Move 3,000 heads of households to living-wage employment. Make quality pre-kindergarten classes universally available in the city. Help two-thirds of the workforce acquire a post-high school degree or certificate. Create 60 units of affordable housing. Help 100 city families become homeowners. The new coalition is asked to adopt nine strategies and 25 action items. It will oversee a sizable network that includes nonprofits, government and business leaders, and seven action teams, each working on a need such as housing, education or sustainable wages. Also, a new nonprofit community development corporation will take on housing and workforce development initiatives. The poverty commission chose not to ask city council or the county commissioners to create a poverty chief or similar position funded by and accountable to elected officials. The new coalition will be accountable to itself and its funders. Chairing the new Coalition to Combat Poverty will be Jennifer Koppel. Koppel said she’ll perform the coalition’s duties in conjunction with her role as executive director of the Lancaster County Coalition to End Homelessness. The new poverty coalition will adopt “collective impact” as its way forward, modeling the approach of the homeless coalition and United Way-funded collaboratives. Collective impact holds that entrenched social problems are best tackled by diverse organizations pulling together toward a shared goal. Agencies working together to attack poverty is not a new concept here. For about a decade at the turn of the millennium, five nonprofits formed The Inner City Group to revitalize the South Duke Street corridor, an effort that expired after achieving some headway. The commission’s report offers comprehensive detail about how to help individual households overcome barriers to self-sufficiency. It says connecting the poor to living-wage employment “is at the core” of the commission’s recommendations. 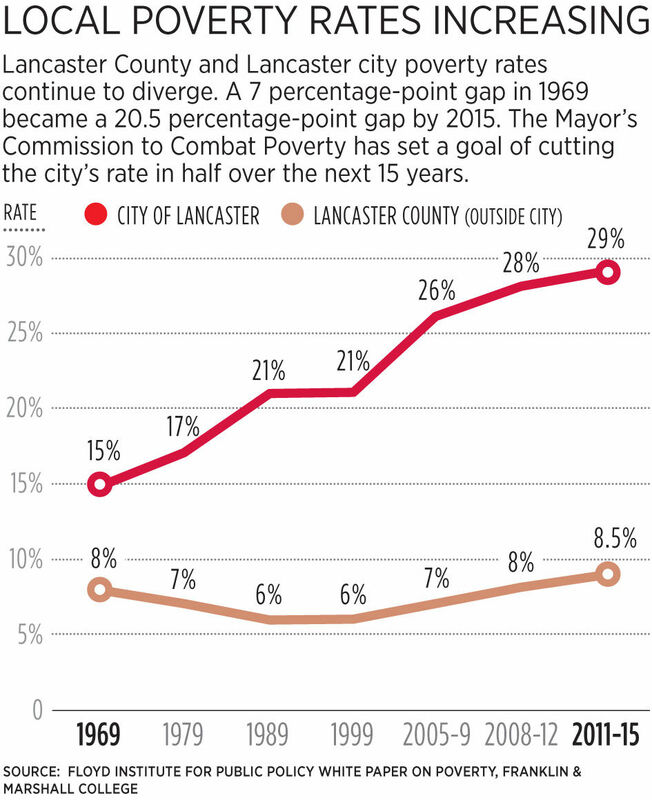 The report is less concrete about how to break up the concentration of poverty in Lancaster neighborhoods where more than 40 percent of households live below federal poverty guidelines. The report, for instance, does not advocate restructuring high-poverty schools or breaking up neighborhoods of public housing that cement hundreds of poor families in Lancaster’s Southeast. The report, however, does contain a chapter, called “Our Apology,” that acknowledges the toxic consequences of racial segregation and 1960s-era urban renewal housing policies. “We’ll need your help to push back against these philosophies and policies, and set the south side of the city back on a path toward prosperity,” the report says. Commission chair Jurman said the report is titled “One Good Job” for a reason. Drawing from an antipoverty initiative in Richmond, Virginia, the report recommends creating a workforce development agency that would be a more nimble and flexible alternative to the state-run CareerLink employment office. The new initiative, for example, would hire “navigators” to work one-on-one with hard-to-hire workers, particularly single mothers, as they seek to overcome training, child care, transportation and other obstacles to employment. The Community Action Partnership already employs seven navigators. Separately, the Community Action Partnership, working with the High companies and nonprofits, has assembled a crew of hard-to-hire workers into a construction/ landscaping team to work on projects in impoverished neighborhoods. The workers get on-the-job training, earn living wages and receive social supports such as budgeting classes. Motivated team members can go on to better-paying positions with High or work with the nonprofit ASSETS to start a small business. “They will earn enough to someday purchase the very homes they’re rehabilitating,” the report says. Education initiatives include expanding the community school model to more city schools, strengthening after-school programs and aligning curriculum with workforce needs. Tom Baldrige, a commission member and president of the Lancaster Chamber of Commerce & Industry, said he entered the yearlong effort hoping for a unique, game-changing solution, but he learned the problem is too big for a silver bullet. Graupera, who brought to the commission’s discussions decades of experience in trying to remake the inner city, said it will take all hands on deck to push the agenda forward. The Lancaster County Community Foundation contributed $65,000 to the commission’s work. Franklin & Marshall College gave $59,000 as part of its annual in-lieu-of-taxes payment. The city paid $11,681, said Patrick Hopkins, the city’s business administrator.